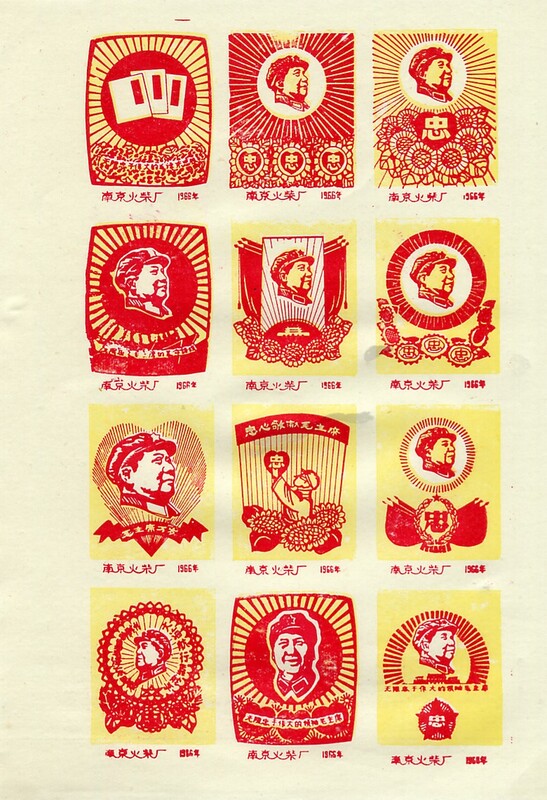 This is the frontispiece to Report and Conclusion on the Second All China Congress of Soviets by the Central Steering Committee and People's Committee of the Chinese Soviet Republic (中華蘇維埃共和國中央執行委員會與人民委員會對第二次全國蘇維埃代表大會的報告和結論), written by Mao Zedong, and published in Moscow in 1934. 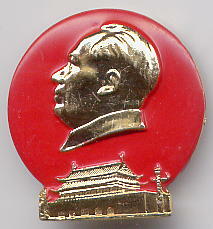 I obtained this tin plaque from Lhasa in March 1985. It was one of half a dozen such plaques that had been cemented to the wall of the Ramoche Temple ར་མོ་ཆེ་དགོན་པ་ for many years, and now lay unwanted after having recently been removed. 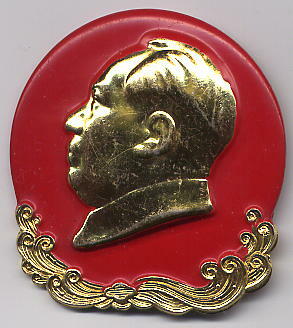 This plaque is unusual in showing Chairman Mao with an undefaced Lin Biao. 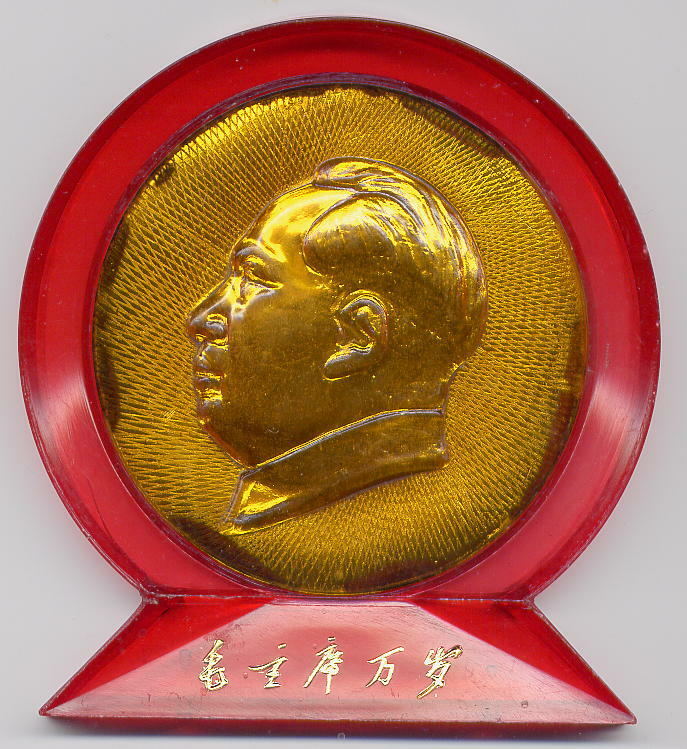 The main Tibetan inscription reads: "Long Live, Long Live, Long Live the Great Leader Chairman Mao !" [伟大的领袖毛主席万岁！万岁！万万岁！]. 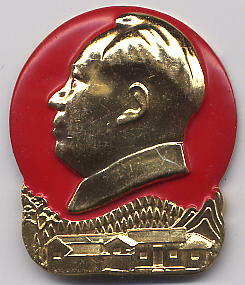 The second two lines of Tibetan read: "The Great Leader Chairman Mao and his closest comrade at arms Comrade Lin Biao at the 1st Plenary Session of the 9th Central Committee of the Communist Party of China" (held in April 1969). 33.0 × 45.0 cm (scanned Image 29.3 × 40.5 cm). The plaque is somewhat battered and bent, and due to its size has had to be scanned in two sections, which do not line up exactly. Also, due to the limitations of my scanner, the rusty gold border that edges the plaque has been omitted from the scanned image. 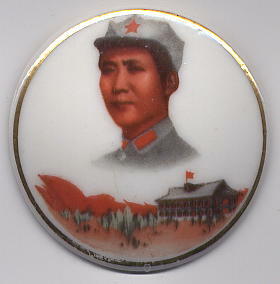 Plastic plaques like this one were to be found in every sitting room in China during the Cultural Revolution. 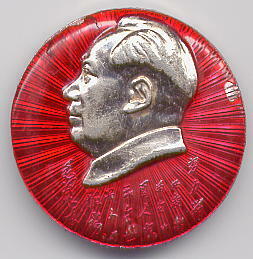 Billions of Mao badges were produced during the early period of the Cultural Revolution, from 1966 to 1971. 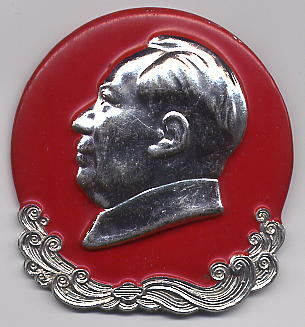 See the Wikipedia article on Chairman Mao badges for more information. 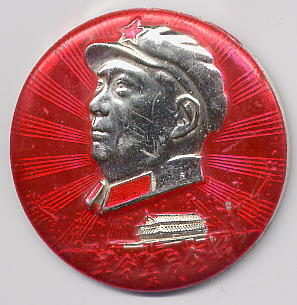 忠 毛主席万岁 广西南宁. 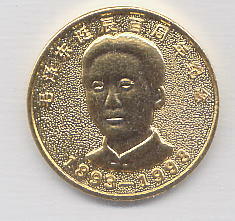 3.5 cm. 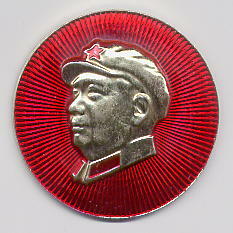 广西3 柳州汽车总站革委会成立纪念 68·9·6. 4.4 cm. 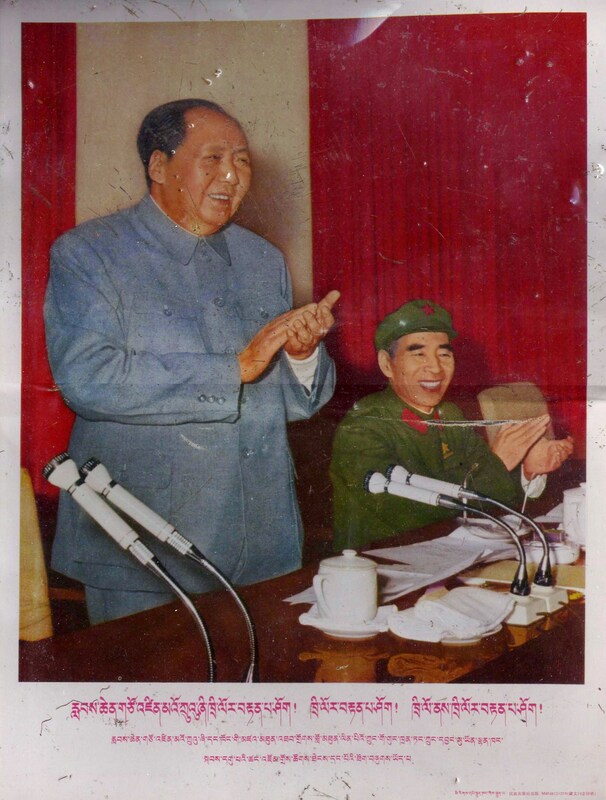 毛主席万岁 柳州市革委会成立纪念 68. 4.4 cm. 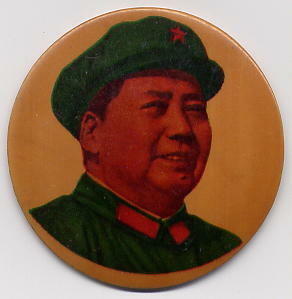 广西南宁 1969·1·7 伟大领袖毛主席冬泳邕江十一周年纪念. 4.5 cm. 拥军爱民 赠给伟大的中国人民解放军 广西壮族自治区革命委员会1969年元旦. 4.8 cm. 拥军爱民 赠给伟大的中国人民解放军 广西壮族自治区革命委员会1969年元旦. 4.9 cm. 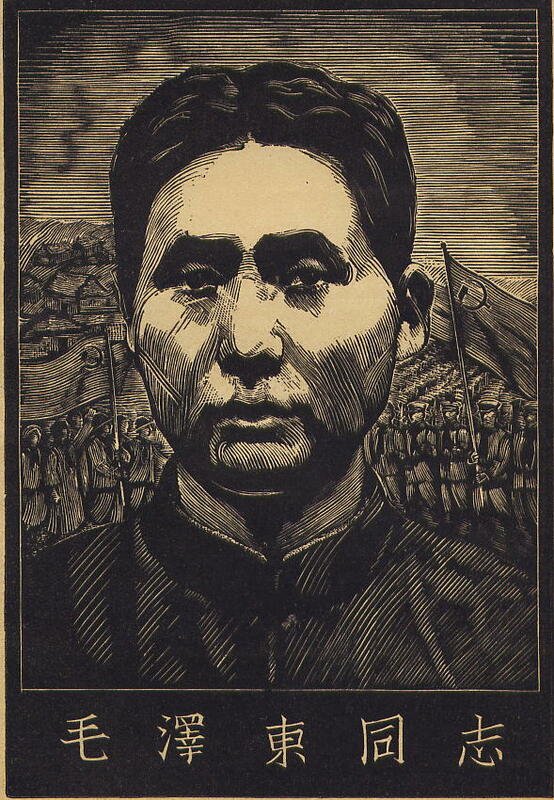 Portrait of the young Mao at Yan'an. 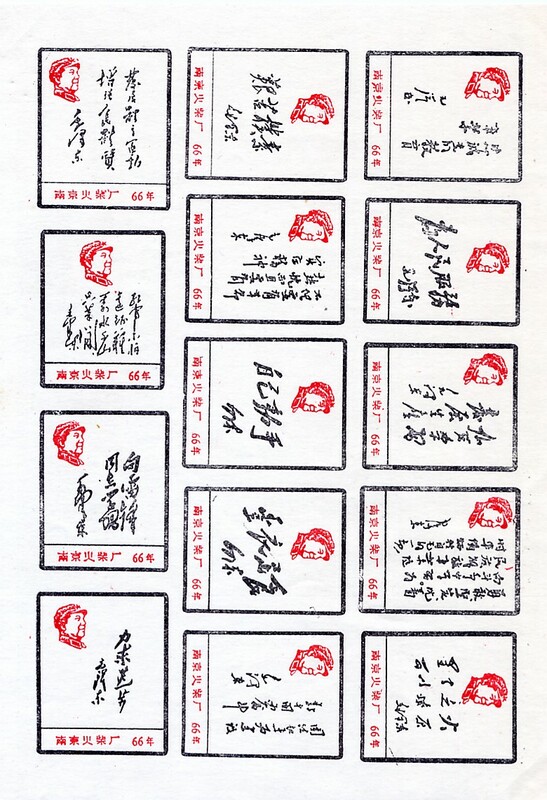 This is a 1986 reprint of a sheet of twelve matchbox labels on the theme of Loyalty to Chairman Mao, originally printed by the Nanjing Match Factory in 1966. 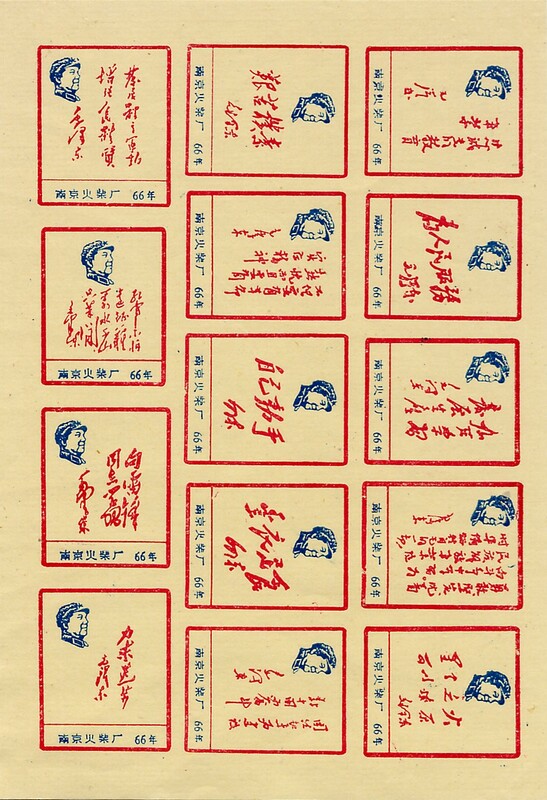 This reprint comprises a set of four sheets printed in various colours. 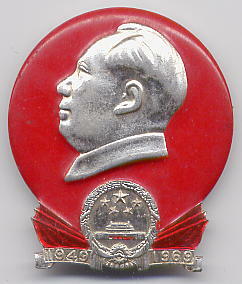 南京火柴厂 66年. 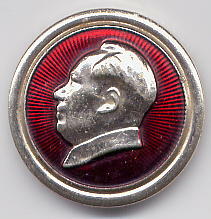 19.5 × 13.5 cm. 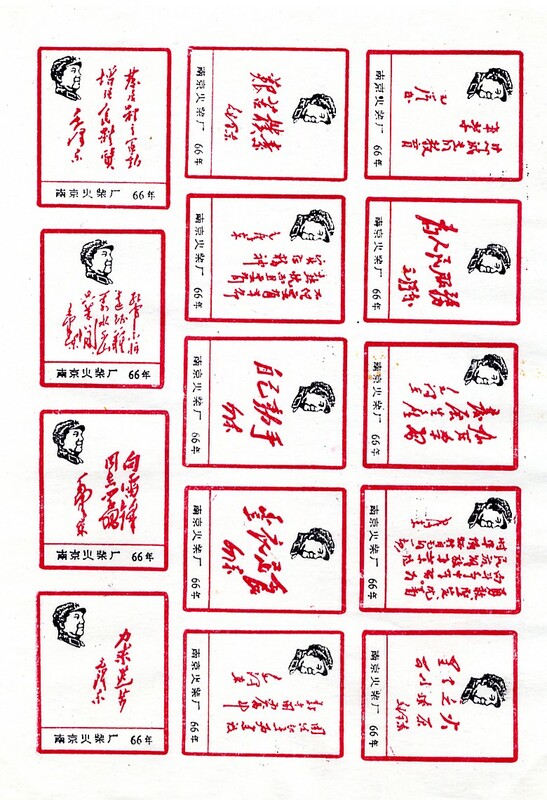 This is a 1986 reprint of a sheet of fourteen matchbox labels with examples of Chairman Mao's calligraphy, originally printed by the Nanjing Match Factory in 1966. This reprint comprises a set of four sheets printed in various colours. 南京火柴厂 66年. 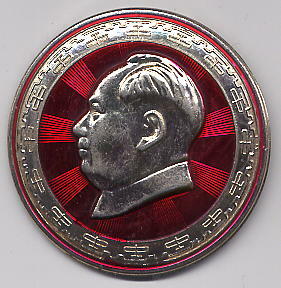 19.3 × 13.5 cm. 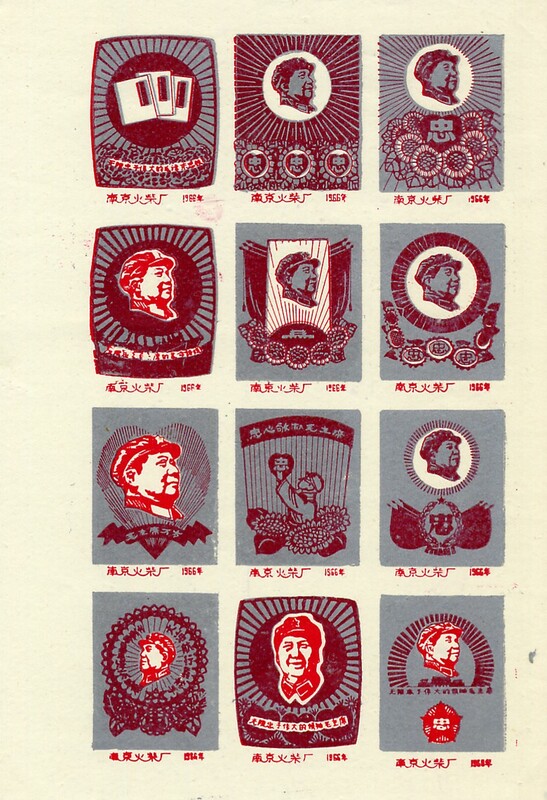 This stamp comes from a set of stamps depicting revolutionary art. 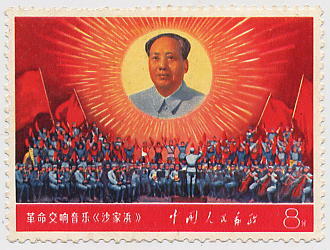 In this stamp Chairman Mao beams down over a performance of the revolutionary symphony, Shajia Bang 沙家浜. 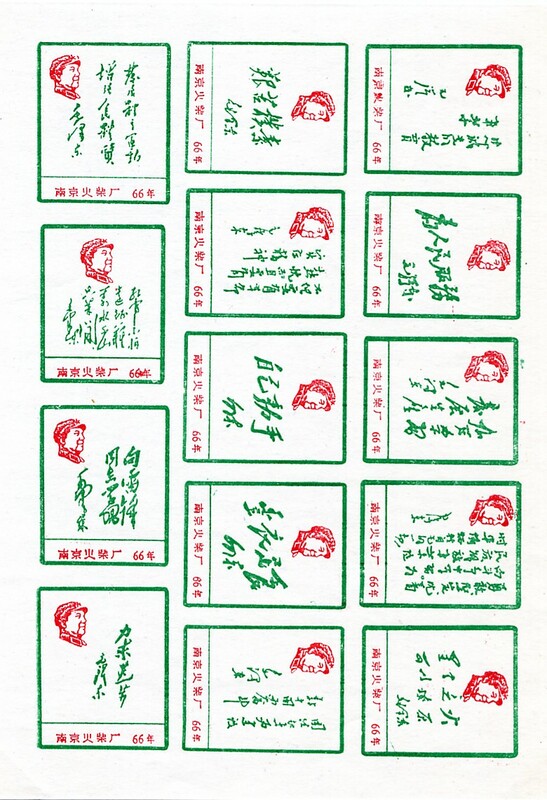 文5 #9 (1968.1.30). 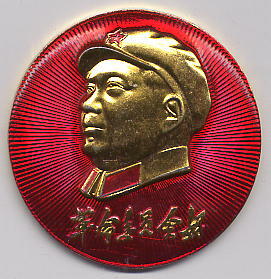 5.5 × 4.0 cm. This set of six stamps commemorates the anniversary of the death of Chairman Mao in 1976. 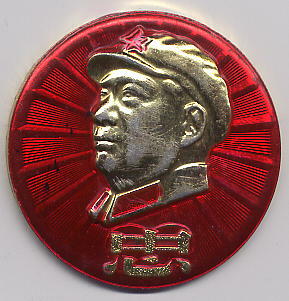 J.21 (1977.9.9). 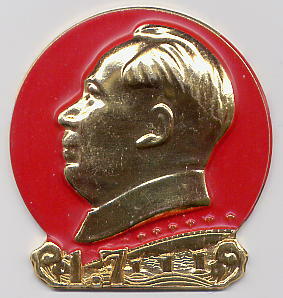 3.1 × 5.3 cm. 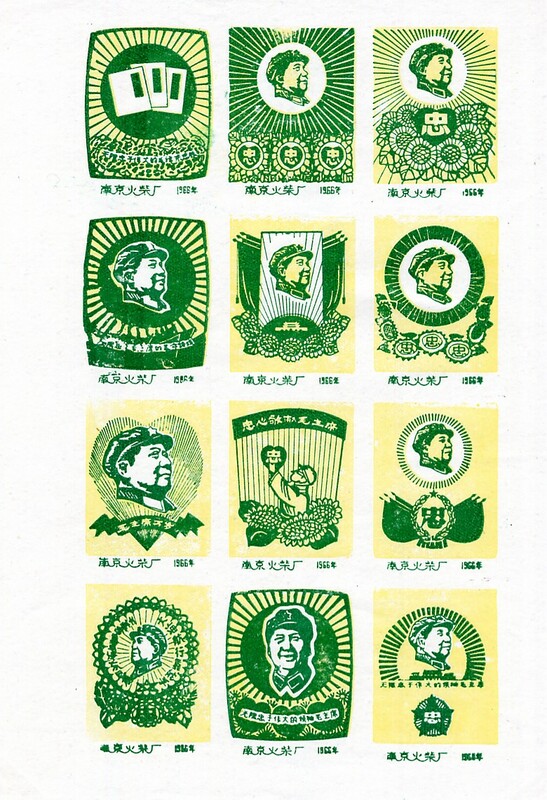 This set of four stamps commemorates the 90th anniversary of the birth of Mao Zedong in 1893. 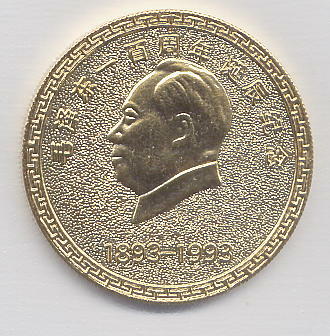 J.97 (1983.12.26). 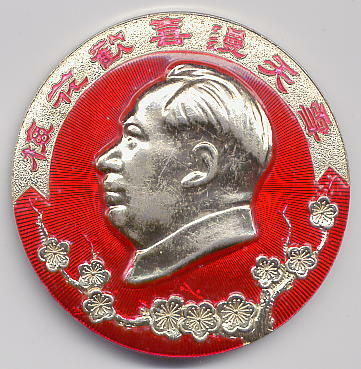 3.0 × 3.9 cm. 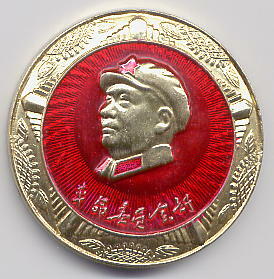 These gold-plated medals commemorate the one hundredth anniversary of the birth of Mao Zedong in 1893. All images on this page were created by myself (Andrew West) from objects in my personal collection, and are licensed under a Creative Commons Attribution-ShareAlike 3.0 Unported License (CC-BY-SA-3.0).